When we talk about life balance, if it’s possible, and how we define it….there is a background to it. What we teach at Your Life Rocks is biblically based. It’s about being obedient to the word of God. When we are in alignment with his word, chaos has no standing. Life can still be moving fast, and full. Some may even say busy. Who am I kidding, I say busy. But good busy. Movement is life. Things happening, having things to do, it’s a blessing. However, it’s the heart of the busy that matters. Do we see our full lives as stress? Do we see it as blessings? An opportunity to live our lives for God? To be a light in the world? Let me set something straight. When we talk about balance or setting goals, the aim is not perfection. The aim is obedience. Everytime. It’s not about us, it’s about him. It’s when we allow ourselves to be less than in any area of life that we are making it about us or about our flesh. There is no judgment, we all have done it. It’s called sin. When I was defining balance for myself, I started with the unbalance. It was easy to define what unbalance was. It was feeling out of control. Hopeless. Powerless. Fearful. Guilty. When I was unbalanced and at the rock bottom, I was focused on one area of my life. The other areas of my life were just daydreams. You see, I would set goals and work toward them, fight for them in my career. I held onto the Proverbs 31 woman as a superhero to justify my work. Using God’s word to fulfill my glory. I wouldn’t set goals the same way for anything else in my life. I might daydream “what could be” or what I wish it was like in my marriage, health, finances, or as a mom. I had Pinterest boards full of images that I wanted my house to look like, my body to look like, or even what my kids should look like. (ouch) But there was no action behind any of it. It was all just fairy tales. Having these images in my head created a false standard to which I knew I could not meet. Stress is the tension between expectation and reality. The further the two move apart, the tighter the tension, the deeper the stress. We are good at planting images of what the expectation should be in different areas of our life without even questioning if that is what we really want. You see, it might be what we want, but do we want it bad enough to do the work to get there? Nothing just happens. It’s all a series of choices. So, we can choose to live a balanced life or a non-balanced life. If being unbalanced was not taking action in neglected areas of life, was the answer more action? Honestly, who has time for that? The answer? The person that makes the time. But before you get the wrong idea here, it’s not just about piling on more to do in your already full day. More action isn’t the answer. Faith is. But faith does require action. Let’s talk about faith. Are you living for you? Or are you living for God? Simple question. If you really consider it, it might be harder to answer than you think. Our gut is always to say, “yes, of course, I am living for God.” But do our actions show it? What are the fruits of your actions? So, if it’s the fruit we are after, let’s start with the seed. How are you setting your goals? Let’s start with your goals. Are you setting them to move closer to God or your own fleshly desires? There is a reason that I define balance by setting and moving toward your goals in 8 areas of life. The Bible guides us and sets the example for each of these. They are all areas that need our attention and action. They are all areas that show fruit. The first one is the foundation for all the others but still stands alone in the fact that we need to be intentional about our growth. It’s faith. Believing God is who he says he is and believing in his promises without a shadow of a doubt. Deepening a relationship with him by knowing him. There are many things you can do to grow in this area. But there is a reason that this is the foundation for the other things. When you are seeking what God would have you do in the other areas of your life, you are getting to know him. By getting into action and working to align your life with his will for each area, is faith in action. You grow in your faith just by giving the other areas of your life to him. Seek and you will find. This area of your life will grow and prosper when you make it the point that you set all the other goals of your life on. So what is God’s will for your life? Whenever I would hear that question in the past, my mind would automatically go to my career. What would he have me do for work? This is also the point where the enemy uses our ego and worldly desires to creep in. Wolf in a sheep’s clothes. We all long for significance, worth, and to be seen. Don’t get me wrong, he has called all of to make an impact and to further his kingdom. But, we have to be careful that we don’t go back to old habits of setting a false expectation, one that is rooted in our fleshly desires, of what that means. If you struggle with this, I recommend looking at career and work last. See what God has to say about his will for your marriage, finances, parenting, and so on first. The more I have grown in my own journey, the more I am in awe of our Lord. Everything we wonder about, lose sleep about, cry about, it’s all in his word. Have you ever read a verse or a book in the Bible and seen something that you never saw before? Like, you have read it several times in the past, heard it preached, and all of a sudden it’s like it’s brand new? The Holy Spirit is mighty and transformative. When we seek God and are fully prepared to align our lives with his will, he will answer what you seek. He is the answer and will reveal himself to you. I say that because as we dive into the other areas of life, I want to encourage you to pray about all of this. Seek what God would have you do. Where he wants you to go. Every area of life is complex. I said it before and I will say it again. It’s not about perfection. Setting Godly goals is just as much about the process as it is about the result. It’s also a renewing process. As you move closer to God’s will in every area of life, God will give you more wisdom. You will see more of him and he will guide you in new ways. I’m going to give you some verses and some thought starters. But these are your goals. When we set goals we have to consider where we are starting from in order to determine where we go. We are all at different places in each area of life, so the next set of goals, that next step in obedience, will look different for all of us. It doesn’t change the truth of what God’s word says, about each one, but your actions to walk out in faith will be your own. This is not a podcast with the answers. But I do hope it points you in the right direction. I feel like a good place to go after faith is marriage. How often have you set goals for your marriage? You might have set a vision for what you want it to be. We all have hopes and dreams. We pray that God would fulfill those for us. But, I have to say, this area has been most under attack by our culture. The view of God’s will for your marriage has gotten so foggy and unclear by media and our society. Recently, someone asked what one piece of marriage advice would you give to a newlywed. I have been married for 17, almost 18 years. (oh, how that makes me feel old…how did that happen?!?!?) I still feel like I have so much to learn in this area. We are not always good at communication. We disagree on a lot of things and we are so very different people. I have been very transparent about my marriage in previous episodes and in videos I have done. More than once I thought about divorce. I was brought up in a divorced home and it extended from there. I can count on one hand how many people in my immediate family had not been divorced and still have fingers left over. It wasn’t that big of a deal to me. Despite all that and the many problems that we have had in our marriage, I knew just what advice to give. Marriage is not about happiness. It’s about holiness. The Bible talks a lot about marriage. How we are supposed to act as wives and how our husbands are supposed to act toward us. But like everything, faith has to come before action. What’s the root of your heart in your marriage? When we make it about what we are getting out of the marriage, that’s when things can start to go wrong. I said it before and I will say it again. I don’t have all the answers. But I know that I am here to support my husband. That’s what I was created for. He is supposed to be the spiritual leader in our home, but I am to be the light that points him to Jesus. Am I being that light? In any relationship, but especially marriage, it’s easy to look at the other person. But what are you doing to take personal accountability? If marriage is about holiness and not about happiness, are you keeping the marriage holy? Are you being the light for your husband? Are you making it easy for him to grow in his faith? A few years ago, my husband and I went to a marriage weekend and I had a huge eye opening moment. They taught us that relationships are circular. One thing leads to the next and the cycle repeats it’s self. The Bible tells us to respect our husband’s and for our husbands to love us. If one person does the opposite of that, it spurs the other person to do the same. That encourages the first person to do more of the same. So, if we disrespect our husbands, they will respond in an unloving way. That makes us disrespect them more, and you can guess how they respond. You can interrupt the pattern. What can you do to respect your husband? Make a list and start doing it. This was hard for me to do. As you can imagine, we went to this weekend because we were not in a good spot. I didn’t want to respect him. I was mad at him and I wanted him to know it. But when I behaved that way, I was leading him to act in a way that was not in alignment with God’s will for him as a husband. Let me say that again. When I was not in alignment with how God wanted me to treat my husband, I was leading him to act out of alignment as well. I know I said earlier that we all have a personal responsibility here. He doesn’t have to follow our lead, but we don’t have to follow his either. For me, this was the first goal in creating balance in my marriage. Respect my husband. Again, it’s not about creating a happy marriage. It’s about creating a holy marriage. One that follows God’s will for it in my life. That’s the faith part. Faith calls for action. So, I started thinking of all the ways that I could show him respect and started doing the easier ones. When I did that, slowly, he started to respond in love. It didn’t happen right away. But this is why we do it in obedience to God and not for the result. But when it did happen….well, I think we have a pretty happy marriage because we decided to make it holy. For a balanced life, we need to focus on our finances. Confession time. I am not good with finances. And money is a funny thing. I have noticed that people are either savers or spenders. I don’t know a lot of people that fall in the middle. The middle is where I long to be. I daydream about having a great credit score, money in savings, investments, and being able to give abundantly. But what does the Bible say about money? A lot. Just search, “what does the Bible say about money” into Google and you will see. There is not a shortage of instruction. Tithing, giving, saving, investing….it’s all there. But remember what I said before, it’s about where you start that directs where you go. I know it’s hard, but we have to avoid the all or nothing thinking. What is your next baby step? Pray about it. That’s the coolest things with goal setting. We don’t have to go it alone! Ask God what he would have you do. What’s the area that he wants you to work on? Start with the heart. Do you love money? Hate money? Did you know that either way, it can be a stumbling block for you? It’s not something we can avoid. We need it to live in this world and it’s not a bad thing. It’s what we tie to within ourselves that is the issue. This is where I will say again to pray. Ask God to show you where you are with this issue. For example, my goal is not to depend on it. That doesn’t mean that I don’t work for it, give, or spend wisely. It’s that I found myself praying for more of it. Telling myself that when more came in I would…..fill in the blank. When I found I was more focused on the getting more of money than getting more of God, I had to change my focus. God has demonstrated so many times in my life and in the Bible that he will provide for every need. Truth is, in the past, money wasn’t an issue. It’s wasn’t really a focus. I had an easy come easy go mindset around it. I made good money, my husband paid the bills and made sure I had enough money to in the bank to live the lifestyle I wanted to live. I know it’s probably a different set up than a lot of other people. But that was the reality. A year ago when I quit my corporate career to start our business, this changed. I now found myself checking the bank account often, looking at the budget and praying for God to provide more. Everything he did provide, I deemed not enough. I would say things with my works, but not with my heart. Why is God holding out? He can give abundantly. Money is nothing to him. So where was it? I was right. Money is nothing to God, but my heart was everything. Where is your heart toward money at? Is it where God wants it to be? My goal: To be faithful and grateful with what is given and to seek God more than money. Where does my hope come from? It’s not that the money that I desire would be used for bad or selflessness. To the contrary. I would be using it to give more, to pay bills, and to have the freedom to pay for things for my kids. I don’t want to spoil my kids. I want them to want. Because it’s when we want that we seek. Through seeking, they will learn who provides. Just like I am doing. But I do want the freedom that money provides. The freedom to send them to Church camp. To travel so they can expand their understanding of the world beyond them. Heck, even the healthy food we are about to talk about requires money. The focus is much different though. By faith, I have to believe that God will provide what we need. But I also have to allow him to define what is the need and what is the want. My first money lesson came from my grandpa. There is a difference between want and need. And as I get older, I have learned that it is always changing depending on the where God has us in our lives. Maybe the spirit would have you give more, or be wiser with your spending. Maybe to put more in the storehouse. Pray about it. Seek your answers. Outside of setting goals for my career, the next biggest goal area is my health. Oh, man have I ever set health goals. This was probably the first goal I ever set in my life. I remember being in like second grade and my best friend on the playground was talking to me about eating more vegetables instead of junk food. I remember one of the recess teachers overhearing the conversation and her looking at me in pity. I was always chubby, and soft. Not really overweight, but not “normal” or skinny. To me, that was always the definition of health. How did I look. What did others think of me. It didn’t help that my mom was beautiful. Everyone thought so. She did a lot to look that way. From eating disorders to surgery. Funny, how health is so closely related to image yet so many people that have the image do things that are not healthy. And we wonder why we struggle? I look at older women in the church, people that I would think are more spiritually mature than me. Looking at their outward image, I often see soft round women. So does God even care about this area of me? Should I just let the goals go? Yet again I am reminded. It’s not what we see in the world, but what God sees in us. So, what does the Bible say about my health and how I am to treat my body? After all, I can’t take it with me. But God so carefully created it. Designed it with purpose. Trashing it just doesn’t make sense. I have noticed that there is a trend to turn the conversation to health and away from vanity. Maybe it’s my age, but I notice more and more people talking about food as medicine. Avoiding chemicals and sugar. Not just because of your waistline, but for your overall health. What to eat and what not to eat. Then you look at the Bible. What to eat and what not to eat. And people judging others on what they eat or don’t eat or how they eat it. In the book of Mark, we see an example of how these kinds of things can become very legalistic. What really matters, again, is the heart. Obedience. I don’t think it’s a secret what we need to do to live in a healthy way. But taking care of our body, eating the right things and working out, it’s hard. We might not want to start. A cookie and a movie might sound better than a run. Here is the clincher. We are to take control over our fleshly desires. The Bible references this often. A lot of these references are toward sexual immorality but my flesh screams out in ways that hurt my health. There is a strength to be gained when we exhibit that control. For me, it’s an emotional response. When I am anxious, I turn to food. Not to my Lord. When I am sad, I turn to food for comfort instead of my comforter. Plain and simple. Food has become an idol. It has replaced God. Now, same can be said for people who over exercise. Seeking fitness instead of God. What we really need is obedience. Obedience to seek him first. If food and moderate exercise can bring health and good health equip us to do the work of God, then why don’t we do it? That is only a question that you can answer. Have you tried to work when you are sick? It’s miserable. What about taking care of your kids, or husband? We need our health. Our health is the vitality of the vessel we are in. It’s like taking care of our car so we can get to work. The better we take care of our car, the more reliable it is. So, what is your health goal? Put better fuel in? Be disciplined? Move your body more? 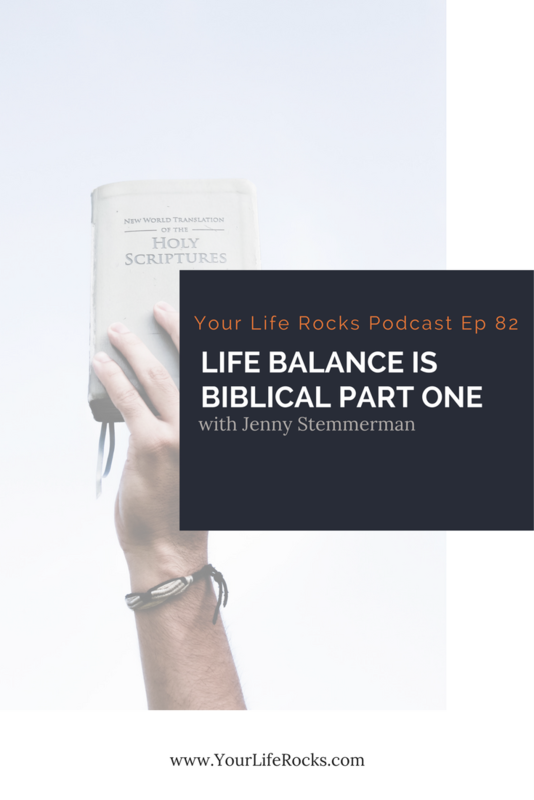 On next week’s episode, we will be diving into finding balance in with parenting, your home, friends/fun, and of course, your career. I hope you hit subscribe so you don’t miss it! Ready to learn the systems to create balance? Join Life Balance Membership for free for the first 7 days. After that, it’s only $9.99 a month.